Need a map of Fiji to help you decide where you'd like to take your next Fiji holiday? This Fiji map offers plenty of inspiration for your next Fiji holiday. Carefully study the map or simply close your eyes and point - it doesn't matter where you go in Fiji it cerntainly won't disappoint! 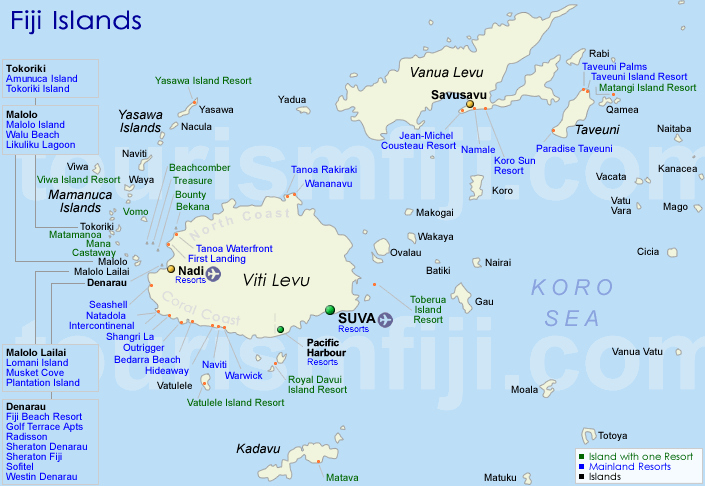 Our Fiji map allows you to quickly and easily see the location of the Fijian Islands, from the main island of Vitu Levu, where the international airport is located in Nadi, to some of the pristine Island groups like the Yasawa Islands and the Mamanuca Islands. Having trouble choosing your accommodation? Study the various locations and nearby attractions on the Fiji map to help you decide.